I haven’t been thinking too much about the CBC lockout and its effect on the state-run broadcaster. This seems to be the case with many Canadians. But, what I do find interesting (from a political blogging perspective) is the commentary behind the scenes in the blogosphere. Gerry Nicholls has commentary from the right and Antonia Zerbisias has coverage on the left. and even one that’s locked in. I’ve remixed a few of these buttons and encourage your to put them on your blogs! You can link them back to this blog post if you like. The CBC is currently in ‘lockout’ mode which means that because it could not come to an agreement with its union, and therefore it has locked-out its workers pending an agreement. Everyone can agree that this move is both contentious and takes a firm position for negotiation with the union representatives. Note that on a webserver, files are static and do not require any active maintenance. ie. before the lockout, there wasn’t a unionized worker keeping the page active for $30/hr (and full dental). To remove the page would require an active effort. 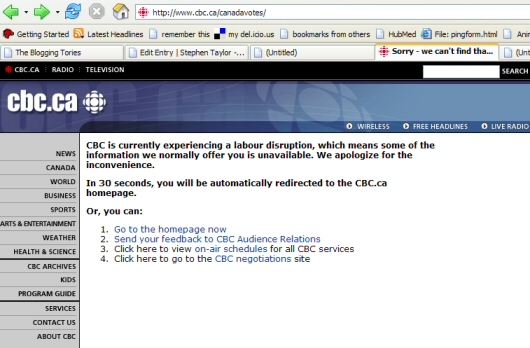 Also note that the CBC locked out the workers! This appears to be some odd effort by the management of the CBC to handicap its own position by interrupting its own service that was on auto-pilot anyways. I can’t explain it.